Welcome to this lovely 3 bedroom, 3 bathroom corner unit condo located in the highly sought out Lighthouse Villas in Tidewater Plantation. This unit has access to an elevator and it is an end unit so no-one is above you or to the right of your space! You'll enjoy a spacious living area filled with natural light and panoramic views of the 9th green! Throughout the unit you will find several upgrades including laminate flooring, travertine tile, upgraded fixtures, granite counters, oversized closets, and slate tile on the screened in porch. The master bedroom features beautiful views of the golf course, private access to the screened in porch, walk in closet, and a huge master bathroom with separate shower and jetted tub! 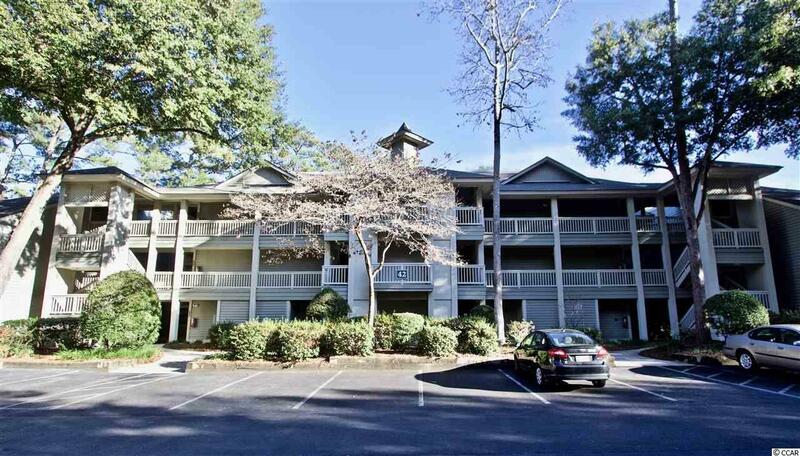 This unit is conveniently located within walking distance to the driving range, putting green, club house restaurant, and bar!. The HOA includes exterior insurance, elevator, water & sewer, basic cable, trash pick up, fitness center, tennis courts, biking, walking, landscaping, pool, private Tidewater beach house fully equipped with beach access, parking, club house, showers, grills and so much more!! Come live the simple beach life at Tidewater Plantation!